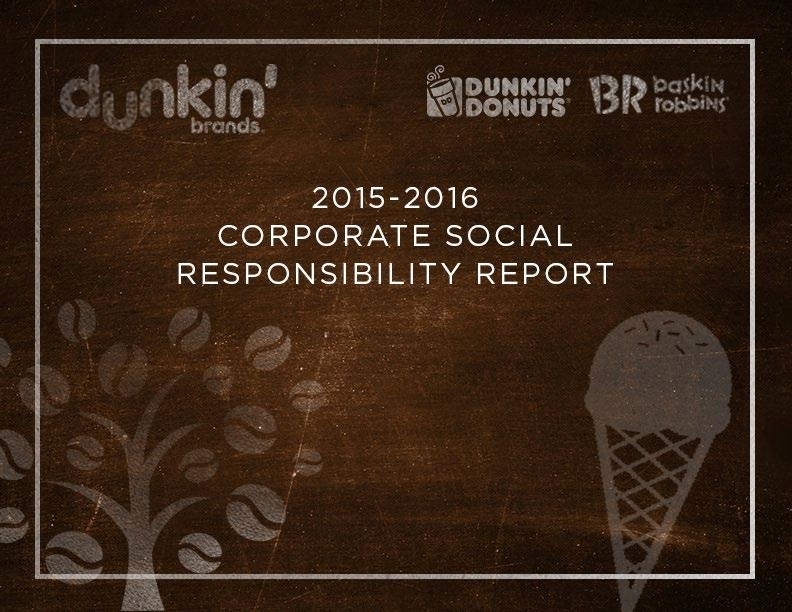 Dunkin’ Brands recognizes that climate change is a global concern and that it is our responsibility to identify and address our impact. The DD Green Achievement™ Program supports our franchisees in their efforts to reduce the impact of our restaurants. DD Green Achievement is a rating system and framework to guide sustainable design and construction practices and is designed to help improve the energy efficiency and sustainability of Dunkin’ U.S. restaurants. DD Green Achievement restaurants are designed to save 25% more energy compared to standard U.S. Dunkin’ restaurants. There are currently more than 190 DD Green Achievement restaurants in the U.S. and we have set a goal to open 500 DD Green Achievement restaurants by the end of 2020. DD Green Achievement has three main themes: Energy, Water and Health. Energy: includes reducing energy use by increasing the efficiency of the lighting, and high efficiency heating and cooling equipment to help lower energy use and emissions. Water: includes installing low-flow faucets and other appliances to prevent and reduce water waste, from water-saving fixtures that create a sufficient flow for washing hands and dishes without wasting water, to landscaping with regionally-friendly plants that need less water, or no water at all. Health: addresses the health of our guests, franchisees and their employees, and the environment. This includes using sustainable materials and paint to help improve the quality of the air, and building restaurants near public transportation to reduce carbon emissions by encouraging alternative transportation. DD Green Achievement is made up of five main stages: Site Development, Store Efficiency, Healthy Indoors, Sustainable Operations, and Innovation and Community. Site Development: The Site Development stage is about getting the construction site ready for building in the most sustainable and eco-friendly way. It also considers the building envelope itself and “setting up” the store for the best energy efficiency and minimal environmental impact. Store Efficiency: The Store Efficiency stage is about the actual equipment and fixtures in the store that can help improve energy efficiency, decrease emissions, and save energy and water. Healthy Indoors: The Healthy Indoors stage is about the materials used inside the building that help achieve a high level of occupant air quality and health. It is also about the use of natural lighting to decrease energy use (that release emissions that pollute the air) and improve the experience inside a Dunkin’ restaurant. Sustainable Operations: The Sustainable Operations stage is about the day-to-day activities that contribute to the sustainability of a Dunkin’ restaurant. While other stages are more about the choices by the construction and design team, this stage also covers the activities of the crew, restaurant managers and the customers. Innovation and Community: The Innovation and Community stage is about advancing sustainability goals by installing renewable energy or electric vehicle charging stations, or by coming up with a whole new sustainable innovation. It also is about introducing the DD Green Achievement restaurant to the community so it can learn about its environmentally-focused benefits.